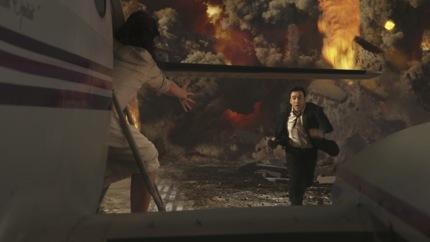 John Cusack flees the Yellowstone Supervolcano in 2012 (photo Courtesy of Columbia Tristar Marketing Group)As a resident of Yellowstone National Park, I have come to accept that I live atop a massive time bomb (residents of the Bay Area of California can identity with this disaster denial syndrome). Underneath my feet a plume of restless, superheated rock extends hundreds of miles into the earth. One day, the pressure of the magma accumulated over thousands of years will release, and spew a plume of lethal ash and gas 100,000 feet into the sky, creating a nuclear winter around the planet. In an instant, the supervolcano will become Yellowstone's most famous--and final--attraction. Its potential to end the world as we know it makes the popular Old Faithful look like a toddler in the geothermal world. The newly released disaster movie 2012 features John Cusack, Danny Glover, and Woody Harrelson, but the real star of the film is the Yellowstone Supervolcano. As Woody Harrelson declares from his front row seat to the eruption as a gigantic burning rock hurls toward him, "It's beautiful." And truly, the site of the pastoral hills of Yellowstone furiously bubbling like boiling water is fascinating to view on screen. The explosion made myself and fellow moviegoers jump out of our seats from the visual (and the good sound system) of the overwhelming force that obliterated my beloved Yellowstone landscape in seconds. I couldn't totally achieve my suspension of disbelief as I did keep wondering where all of the park's plentiful herds of bison and elk were in the scenery--the film showed only one dead elk and nary a bison. While much of the plot of 2012 is purely fictional, the Yellowstone supervolcano is not simply a screenwriter's speculation. Much of Yellowstone National Park is located on a caldera that spans approximately 45 miles and is considered one of the world’s most active geologic hot spots. National Geographic recently featured an article on the park's volcanic activity and detailed its turbulent history, which included dozens of volcanic eruptions spanning back 18 million years with three "supervolcanos," one of which left a hole in the ground the size of the state of Rhode Island . “We call this a caldera at unrest,” geophysicist Bob Smith said of Yellowstone in the article. The supervolcano activity in Yellowstone appears to be on a 700,000 year cycle--give or take 50,000 years. Since the most recent eruption occurred 640,000 years ago, some scientists have speculated the next one is imminent. A recent flurry of earthquake activity in the winter of 2008/2009, which resulted in a swarm of 900 seismic events over a two week period, fueled rumors that the "big one" was approaching. Yet the exact date is anyone's guess and no scientific evidence points to a 2012 scenario. Will the supervolcano erupt on December 21, 2012? Probably not. And even though I don't believe the world will end on that date, those of us who reside in Yellowstone might have a few anxious moments when the day arrives. At least we can take comfort in knowing that like Woody Harrelson's character in 2012, we'll have front-row seats for the catastrophe and avoid the apocalyptic nuclear winter that will follow. Until then, I'll blissfully ignore that lurking under my home is a force capable of planetary destruction. See below for a video that details how the VFX team for 2012 created the Yellowstone supervolcano eruption.